The Global Volcanism Program has no activity reports for Nemrut Dagi. The Global Volcanism Program has no Weekly Reports available for Nemrut Dagi. The Global Volcanism Program has no Bulletin Reports available for Nemrut Dagi. Nemrut Dagi is the westernmost of a group of volcanoes near Lake Van in eastern Anatolia and the only one that has erupted in historical time. It contains a 9 x 5 km caldera partially filled on its western side by a caldera lake. Post-caldera volcanism, of basaltic to rhyolitic composition, initially occurred along the caldera rim and floor. Pyroclastic flows and the emission of glassy obsidian lava flows accompanied construction of lava domes within the caldera; later activity formed a series of cinder cones and lava domes erupted along N-S-trending fissures on the northern flank. The most recent activity has been concentrated along a NNW-trending fissure cutting the eastern caldera floor and extending beyond the north caldera rim; nearly two dozen cinder cones and lava domes were constructed on the caldera floor. Ash layers in Lake Van document numerous Holocene eruptions, and an historical eruption in 1441 CE from a N-flank fissure involved compositionally bimodal lava flows. Aydar E, Gourgaud A, Ulusoy I, Digonnet F, Labazuy P, Sen E, Bayhan H, Kurttas T, Tolluoglu A U, 2003. Morphological analysis of active Mount Nemrut stratovolcano, eastern Turkey: evidences and possible impact areas of future eruption. J. Volcanol. Geotherm. Res., 123: 301-312. Guner Y, 1984. Geology, geomorphology and evolution of the Nemrut volcano. Jeomorfoloji Dergisi, 12: 23-65 (in Turkish with English abs). Haroutiunian R A, 2006. The historical volcanoes of Armenia and adjacent areas revisited. J. Volcanol. Geotherm. Res., 155: 334-337. Karakhanian A, Jrbashyan R, Trifonov V, Philip H, Arakelian S, Avagyan A, Baghdassaryan H, Davtian V, 2006. Historical volcanoes of Armenia and adjacent areas: what is revisited?. J. Volcanol. Geotherm. Res., 155: 338-345. Ozpeker I, 1973. Volcanological evolution of Nemrut Dagi. 4th Symp Mech Sci Res Center Turkey, p 1-17 (in Turkish). Tchalenko J S, 1977. A reconnaissance of the seismicity and tectonics at the northern border of the Arabian Plate (Lake Van region). Rev Geog Phys Geol Dynam, 19: 189-208. Ulusoy I, Labazuy P, Aydar E, Ersoy O, Cubukcu E, 2008. Structure of the Nemrut caldera (Eastern Anatolia, Turkey) and associated hydrothermal fluid circulation. J. Volcanol. Geotherm. Res., 174: 269-283. Yilmaz Y, Guner Y, Saroglu F, 1998. Geology of the Quaternary volcanic centers of the east Anatolia. J. Volcanol. Geotherm. Res., 85: 173-210. There is no Deformation History data available for Nemrut Dagi. There is no Emissions History data available for Nemrut Dagi. The prominent caldera in the center of the photo is Nemrut Dagi, the westernmost of a group of volcanoes near Lake Van. Nemrut Dagi lies north of the western part of Lake Van and is the only one of the group that has erupted in historical time. 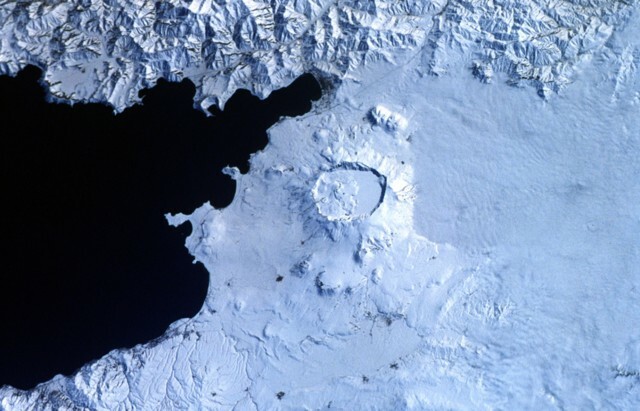 The 9 x 5 km caldera is partially filled by a lake, which appears as the smooth snow-covered right-hand side of the caldera floor in this near-vertical Space Shuttle photo with north to the bottom. Ash layers in Lake Van document numerous Holocene eruptions, the last of which took place in 1441 CE. NASA Space Shuttle image STS45-80-08, 1992 (http://eol.jsc.nasa.gov/). 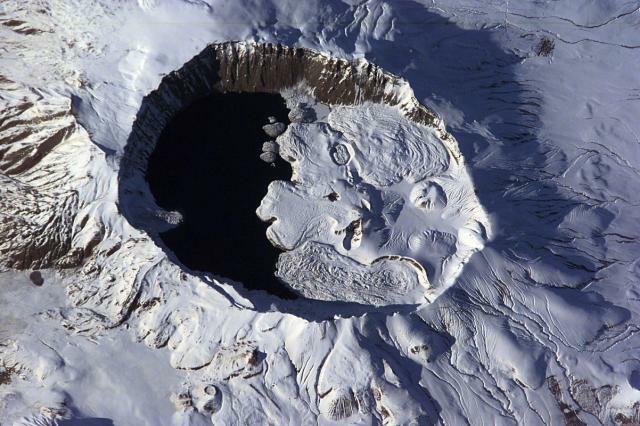 A dramatic 9 x 5 km caldera truncates the summit of Nemrut Dagi volcano near Lake Van in eastern Turkey. A lake that partially fills the western side of the caldera is constrained by post-caldera eruptions that produced glassy obsidian lava flows from lava domes on the eastern caldera floor. A series of cinder cones and lava domes were erupted along N-S-trending fissures on the northern flank. Ash layers in Lake Van document numerous Holocene eruptions from Nemrut Dagi. NASA Space Shuttle image ISS001-E-6354, 2001 (http://eol.jsc.nasa.gov/). There are no samples for Nemrut Dagi in the Smithsonian's NMNH Department of Mineral Sciences Rock and Ore collection. Large Eruptions of Nemrut Dagi Information about large Quaternary eruptions (VEI >= 4) is cataloged in the Large Magnitude Explosive Volcanic Eruptions (LaMEVE) database of the Volcano Global Risk Identification and Analysis Project (VOGRIPA).